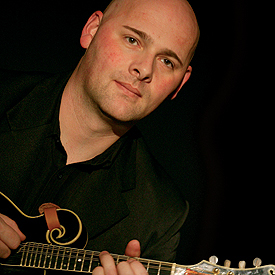 As well as a fine fiddler, guitarist, composer, producer and wit, Simon Mayor is one of the world’s leading mandolin players. His live performances are a riot of humourous anecdotes and off-the-cuff wit alongside dazzling musicianship. Simon Mayor has an unequalled reputation in folk and classical circles alike. His recordings have been heralded across the media from magazines such as as Q, Vox, fRoots, Rock ‘n’ Reel, The Living Tradition (Scotland), Sing Out (USA, Trad Mag (France) and Cosmopolitan, to BBC World Service’ BBC World Service, Radio 2 , Radio 3’s In Tune and the Classic FM Artist Chart top ten. 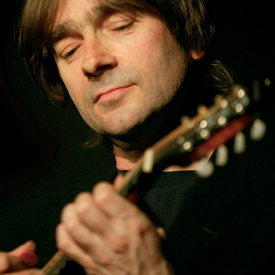 With his debut ‘The Mandolin Album’, he embarked on a series of recordings to realise his longstanding intention to give the mandolin a uniquely British voice. The CD was immediately made Album of the Week on BBC Radio 2 receiving popular and critical acclaim. 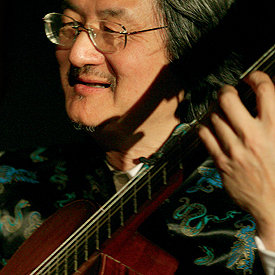 His mix of original and traditional material alongside classical showstoppers has brought widespread recognition with invitations from around the globe including the USA (The Classical Mandolin Society of America), Canada (The Stephen Leacock Humour Festival) and Germany (Rudolstadt World Music Festival). His passion for the mandolin has produced a wealth of teaching books and DVDs, including ‘New Celtic Mandolin’ and ‘The Mandolin Tutor’, which is now widely regarded as the standard work for the instrument. From the Wigmore Hall to the Glastonbury Festival to conducting the National Youth Guitar Ensemble, Gerald Garcia’s reputation is confirmed as one of the world’s finest guitarists. He has toured with the likes of John Williams and Paco Pena, appeared with such diverse talents as Michel Legrand, Barbara Streisand, Larry Coryell and Wayne Shorter, has six solo albums out on the Naxos label… and always brings the wackiest sense of humour to his performances! Gerald studied Chemistry at Oxford University and now lives in Oxford where he enjoys cycling, cooking, computer music, Taoist Yoga and conducting. Hilary James may be best known for her fine singing, but she also takes her place in the Mandolinquents pounding the mighty mandobass. Her superb voice defies categorisation and has featured everywhere from Classic FM to Radio 1’s Andy Kershaw. 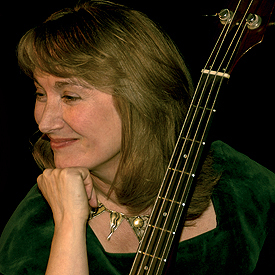 Covering everything from traditional folk music to blues and swing, her four solo CDs have been played on radio stations from Los Angeles to Latvia and brought an invitation to make a video with MTV award winning editor/producer Dan Lebenthal in Hollywood. Hilary James presented music education programmes for national BBC Radio for six years and has illustrated a children’s song book for Faber Music. Together with Simon Mayor she has written over 60 children’s songs, as well as topical songs for news programmes. Hilary is also making a name for herself as an artist, painting large canvases whenever she gets the time. Richard Collins appeared as both actor and musician with the Royal Shakespeare Company in their 2002 production of ‘A Winter’s Tale’. His latest project is a plectrum style guitar teaching DVD which he managed to record alongside Mandolinquents commitments and his own, ‘A Band like Alice’, which recently recorded an album for EMI’s world music series. When he gets the time he indulges in what he was trained for – maintaining and tuning pianos. To give you a bit of Richard’s background, he first picked up a guitar at the age of nine and within a couple of years was stunningly adept on a number of stringed instruments. Apart from his consummate skill as a musician, Richard has reputedly the largest repertoire of self-deprecating banjo jokes in the world.